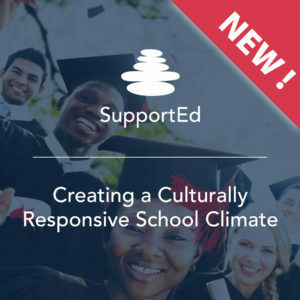 A culturally responsive school climate is integral to the work of educating multilingual learners (MLs) and fostering positive relationships with their families. However, knowing what steps to take to develop a culturally responsive climate in classrooms and schools can be challenging. This course, specifically designed for teachers, administrators, and support staff working with MLs and their families, will provide you with a toolbox of strategies that you can implement in your context to strengthen your use of culturally responsive teaching practices. As in all of SupportEd’s popular online courses, this course includes facilitated Professional Learning Community (PLC)-based discussions and application activities. Through these discussions and activities, you will be able to try out and reflect on the strategies that you learn about in the course, share your expertise with colleagues, and learn strategies others are successfully using to build a culturally responsive climate in their schools and classrooms.